Alan Sorrell was born at Tooting in South London in 1904. When he was two years old, the family moved to the seaside town of Southend in Essex. His father, who was master jeweller and watch-maker, and in his leisure time a keen amateur painter, died suddenly in 1910. From his earliest years, Alan Sorrell showed a passion for drawing and painting and, somewhat against the wishes of his family, who had other plans for him, persevered in his ambition to become a painter. He began his training at the Southend Municipal School of Art in 1919, and after four year’s study, and a further year in the City supporting himself as a commercial designer, was admitted to the Royal College of Art in 1924. In 1928, he won the Prix de Rome in painting with a composition of allegorical figures for a wall-decoration, entitled ‘People seeking after Wisdom’. The scholarship took him to the British School at Rome for two years. 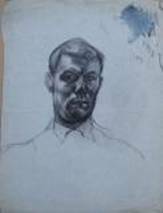 He has left a varied account of his time there, and is unsparing in his portrait of an earnest, rather timid young man with his ‘small tradesman’s attitudes, Non-conformist prejudices, and long-pondered theories of art. In Italy he had what every artist needs, time to search and study and think, and the stimulus of contact with scholars of other disciplines. The note of facetious self-depreciation is insistent, but he was as yet struggling to find his way. 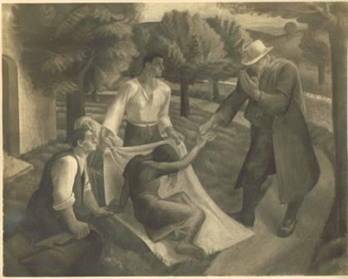 He returned to England in 1931 with a new confidence, keenly anticipating the schemes of mural decoration he would be called upon to undertake, and with visions of vast wall-spaces to be filled, in town halls and Parliament buildings. 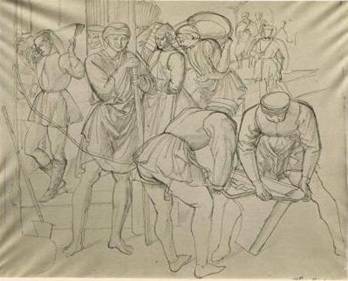 Sir William Rothenstein, the Principal of the college, who had always been very kind and interested in his work, offered him a post on the teaching staff of the College, as an instructor of drawing, which relieved him of some present anxieties. Turning again to the consideration of the painting ‘jobs’, he now bethought him of his home town of Southend, and more particularly of the Municipal Library, with its walls of ‘bluish-white’ plaster, as a suitable candidate. He approached the Mayor of Southend, and with gratifying ease, secured the commission of four large panels. The chosen subjects were to be ‘history book’ themes, which was rather a disappointment to this young artist, who had planned a series of ‘genuine historical paintings of the only history we can know—that of our own time’, but his gratitude overrode his disappointment. 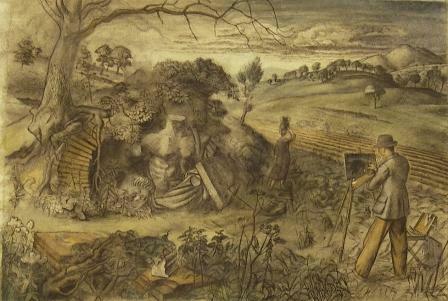 Fortunately, although the period and incidents of the proposed decoration were foreign to him, he knew the setting—Old Leigh and its surroundings– very intimately from his childhood, and so, with a gust of enthusiasm, he summarised his task: ‘The problem was to pierce the skin of building which had spread over the hillsides, plant them again with trees, mentally demolish that ugly gasometer and the railway that has cut through the fishing village, and then rebuild the wharves, people them with those oddly dressed Cromwellian figures, fill the estuary with white-sailed ships-of-the-line—and there would be the picture’. Armed with the answers to these questions, he went down to Old Leigh on a fine spring weekend, to spy out the land and make studies. He was always an artist first, and so the quality of ‘seeing’ was his major preoccupation: from this would flow ideas and convincing reality. 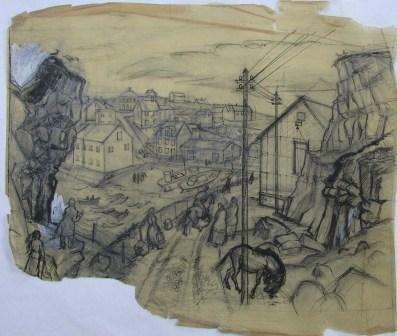 To revisit the neighbourhood and setting of his painting was of fundamental importance. He filled his sketchbook with pencil drawings of old houses which he hoped were typical, trees, the rippling hills. Structural facts were important: how a chimney stack joins the roof, how the branches of a tree really sprout from the main stem. When the tide came in, he hired an old fisherman to take him out in his boat the Saucy Ann, to ‘observe the relative tones of sea, shore and sky’. In his inexperience, he attempted to sketch in oils from the heaving boat, while the old fisherman humorously made movements ‘to check the pitching sir’, which seemed rather to add to his difficulties. His preliminary studies continued in London, with the searching-out of information on Cromwellian shipping, costumes and armour. The Print Room of the Victoria and Albert Museum supplied a box full of fine 17thC Dutch engravings of dockyard scenes and ships, many which he confessed to have surreptitiously traced off! A prominent feature of the painting would show a ship healed over for repairs, and he found evidence to explain this delicate operation. Many other interesting little facts now came together, and at last the picture began to form in his mind. His firs pen and ink scribbles of the design was produced after ‘prolonged browing’ over his accumulated material, and contained the seed of all that was to come. A second scribble clarified the shapes without radical change. This looked promising, so he enlarged it, copying now, and squared up the result for transference on to his cartoon, or working drawing. The cartoon was yet another stage in the ‘learning’ of his subject. Traditionally, the artist will use it to make all the major decisions about size and shape, so as to eliminate such problems from the final surface. In this instance, this penultimate stage fully justified itself, by exposing areas of vagueness in the design, which involved him in further studies. In particular, his ignorance of the functioning of sailing ships as pieces of machinery, with their masses of masts and spars and rigging, led him to make ‘numberless drawings’ of contemporary ship models at the Science Museum. To complete his understanding, he found it necessary to trace the various ropes ‘literally from end to end, from the stanchion to which the one end was secured, the spar or sail which was moved by its other extremity’. He concluded that ‘the effect of truth cannot be obtained without this understanding of cause and effect’. Mr Sorrell’s powers of invention, his sense of the dramatic essence of life, give a high value to his work. In everything he does lie power and conviction and he has a poetical vision which makes him as one of the great company of English poets and painters. With hindsight, ‘Admiral Blake’ can also be claimed as Alan Sorrell’s first serious attempt at ‘reconstruction’. All the elements that characterise his later work are already at play in this first unconscious exercise. His ambition was still to be a mural painter, but he as already discovering that his sure strength lay as a draughtsman, and this and necessity impelled him to other possibilities. Self-Portrait from his first year as a Rome Scholar. Pingvellir is the place where the Icelandic parliament used to meet once a year, and which they say is the oldest parliament in the world. It can be identified by the lake, church and what is now the president’s summer residence in the background. 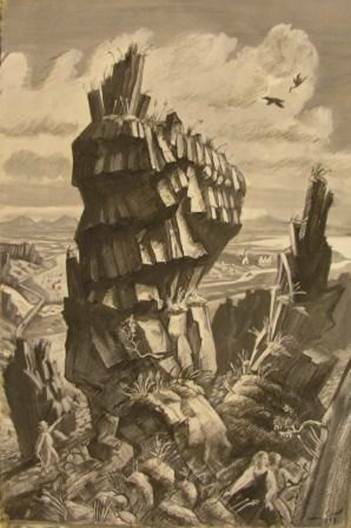 Alan Sorrell was mainly interested in the surreal qualities of the volcanic rock. Little did he know that he was standing on the edge of the American tectonic plate, that the valley below was no-man’s land formed barely 2000 years ago, and that in the distance is the escarpment of the European plate. 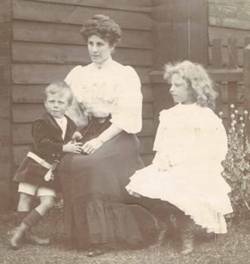 Early photograph of Alan with his mother Edith and sister Doris. During his first year as a Rome Scholar, Alan Sorrell travelled around Tuscany, and in particular visited Arezzo, where he copied the work of Piero della Francesca, and Pisa where he copied the Tower of Babel by Benozzo Gozzoli. A painting from his time as a Rome Scholar, only known by this B & W photo, although a similar painting is now in the possession of the Tullie House Art Gallery, Carlisle. The first subject was to be the ‘Refitting of Admiral Blake’s Fleet at Leigh’ in 1652, 2.74 metres by 1.22 metres. How was this to be tackled? He consoled himself that the subject did not really matter: ‘Fine shape and colour is possible whether you deal with Admiral Blake or apples on a plate: the only disappointment of dealing with unfamiliar shapes and scenes is that you cannot understand them so well, or consider them as intimately, as you would everyday things’. 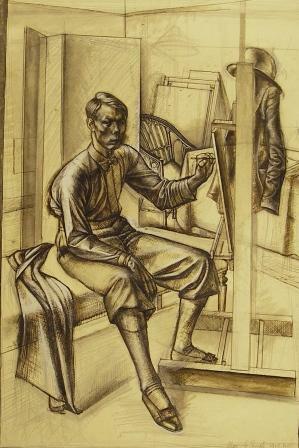 The first task of the artist who does not know his subject, he concluded, must be to learn it before he can properly paint it, ‘with an intense study of the object, each square yard of land, sea and sky, and then perhaps, when your pencil goes to paper, or your brush to the canvas, it will be handled with , at any rate, some degree of certainty and conviction’.